Since the advent of space travel and artificial gravity, starship construction moved rapidly from production within ground based facilities into orbital shipyards. These stations have expanded in the millennia since, creating massive sprawls, even orbital rings over some worlds such as Kuat. However, the need for smaller production centers for both companies and family shipwrights continues to drive the need for smaller, more precise, machinery to create both light freighters and many fighters. Using modern technology the SY-1-FI Shipyard, or Shipyard I, has become the norm for such production. Using a smaller work crew and space, the Shipyard I features state-of-the-art automated foundry and industrial equipment to convert even the most basic of raw materials into the components of a starship. 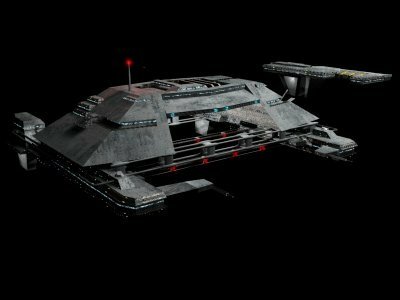 Given these technological advantages, as well as its ability to create ships of war and luxury, many companies and governments have abandoned older designs and have instead begun extensive use of the Shipyard I and its larger counterparts. Due to the usefulness of the design in creating either wealth or power, the station itself is considered a primary target to most navies. For these reasons the design was modified yet again to give it some teeth of its own. Armed with both heavy lasers and a tractor beam, the Shipyard I is capable of repelling light attacks. Today the Shipyard I is a common sight in the galaxy, and if it were not for the concerns of orbital drift there would be more of them than ground based factories. Regardless, the Shipyard I has become the staple of industrial development and infrastructure in the modern age, and will likely continue to be into the near future.